Possible Chase Setup Sunday, March 7? Update: Wednesday, 3 March: 1:00 p.m. 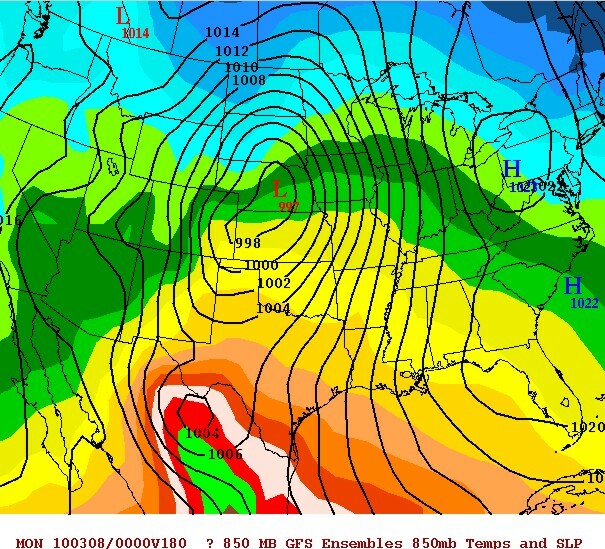 The shortwave is slowing down in the models..not ejecting into west Texas until after dark on Sunday evening. If these trends are correct then much of central and western Texas will simply see a thick deck of low level clouds and a bunch of rain on Sunday. Any severe potential won’t occur until after dark as the shortwave moves in from the west. 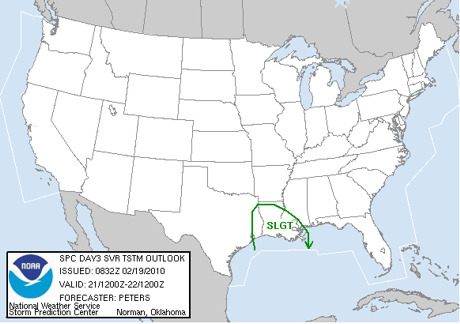 As the shortwave ejects into eastern Texas/Louisiana on Monday there may be some severe potential there. But timing is clearly an issue, so it’s too early to talk about anything specific. You know if I’m spending this much time talking about marginal setups a week in advance now, I can’t imagine how I’ll handle this blog once classic Spring setups occur. Or maybe I’m just bored with the weather I get up here in New England for the next few weeks…. Update: Tuesday, 2 March: 2:00 p.m.
As mentioned in the previous update the Gulf of Mexico will be be robbed of quality moisture (surface dewpoints in the 60s) this week as strong cold fronts give it a beating (so to speak). But the southwestern Gulf will retain dewpoints in the upper 50s to lower 60s by Friday evening. Then all day Saturday and all day Sunday southeasterly flow is expected at the surface from the western Gulf into Texas. This will allow for low level moisture to ride up the high terrain of southern and western Texas by Sunday afternoon/evening. But alas there is a big problem – low level cloud cover. As low to mid 50s dewpoints surges into southern, central and western Texas Saturday night into Sunday a thick low level cloud deck will form. This is even more evident given the high soil moisture values present across much of central and southern Texas. The GFS indicates this with it’s high 850mb relative humidity values on Sunday across Texas. It also develops lots of precipitation along and just north of the nose of the low level moisture Sunday morning through midday Sunday. But one good thing I can say about cloud cover is according to the GFS there won’t be a cirrus deck over western Texas, as the models indicates a clear slot moving through by midday. So if the early March sunshine can erode the thick, low level cloud deck over western Texas on Sunday then there’s the potential for supercells (and maybe even tornadoes) to fire along the dryline over west Texas. There’s a lot going against this setup, but the potential is there. Update: Monday, 1 March: 10:00 a.m.
One thing I completely neglected to consider was the current soil moisture anomalies across the southern Plains and the Gulf Coast. 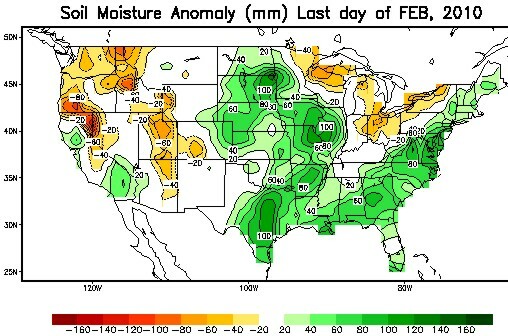 See the image below for Feb 28 soil moisture anomalies. It’s very interesting to see very high soil moisture anomalies over Texas – in particular central to southern Texas. This is the region where low level moisture often times sneaks up from the western and southwestern Gulf. Soil Moisture Anomalies February 28. The Gulf is going to get beaten pretty bad over the next few days with strong cold fronts. But after looking at a few model solutions it appears the extreme southwestern Gulf will not take a direct hit. Below is the GFS surface dewpoints forecast for Friday evening (March 5). Notice how there are still 60F dewpoints over the southwestern Gulf. When moisture begins the painful process of trying to lift north and northwest over the weekend, these 60F dewpoints will have the luxury of advecting over very wet soil in southern and central Texas. This presents more hope for adequate moisture to support severe potential on Sunday, March 7 ahead of the shortwave across the southern Plains. Sunday, 28 February: 9:30 p.m.
Well it’s interesting that the GFS Operational model is forecasting a strong storm system to dig in the Plains the weekend of March 6 and 7. This storm system is a product of an active southern jet stream thanks to El Nino. Some storm chasers are already getting pretty excited about the potential for a chase day somewhere across the southern Plains the weekend of March 6/7. I can’t blame them either. It’s been a long, cold winter for many and we are all more than ready for the first good chase setup of the Spring. Below is the 12z Feb 28 GFS Ensemble mean surface pressures forecast for Sunday evening on March 7. It is forecasting a pretty deep surface low over the central Plains, which would bring the potential for a decent chase setup across much of the central to southern Plains if enough boundary layer moisture can return north from the Gulf of Mexico. 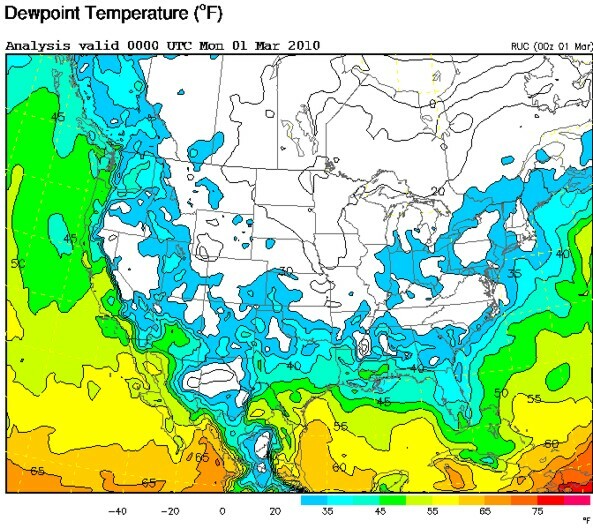 But current dewpoints (see image below) across the Gulf of Mexico range from the 30s over the northern Gulf to the lower 60s across the southwestern Gulf. Meanwhile over the next five days strong cold fronts are expected to further starve the Gulf and even Caribbean from deep moisture. The sea surface temperatures are even running a bit below normal, which means it will take longer than normal for constant sunshine over the Gulf to result in rich dewpoints. So for now I’m not too optimistic about the severe potential around March 6-8 across the Plains, but we’ll see. Things can change and moisture can sometimes return in surprising ways. NYC (Central Park) set an all time monthly snowfall record at noon today with 35.9 inches of snow this month. This breaks the all time record for total snow in one month in Central Park set back in March of 1896 when 30.5 inches of snow fell that month. I don’t think the snow is over for the season – not yet. We are in a stormy weather pattern and computer models are showing yet another potentially big snowstorm for the Mid Atlantic/Northeast coast on Wednesday. It’s the winter that won’t end! I would say Spring is just around the corner, but then I’d just be messing your heads. The never ending winter continues…..
Friday, 26 February : 9 a.m. EST. I knew there would be a dramatic difference in snow accumulation from NYC into southwestern Connecticut, but this is impressive. Central Park measured 16.9 inches of snow at 7 a.m. this morning! Areas further north across the lower Hudson Vally of New York have around two feet of snow! Contrast those totals with the 1 inch measured at Bridgeport, CT at 7 a.m. What a dramatic difference 40 miles has made. But now the snow is coming down in earnest across southern/western Connecticut – finally. The upper level low is nearly stationary for now and producing moderate snow across southwestern CT where very little snow fell earlier this morning. Below is the radar loop from 8:45 a.m. EST. Notice how the snow band has set itself up over western CT just north of the area of low pressure. As long as the low doesn’t retrograde during the day, southwestern CT may actually end up getting 3-5 inches of snow from this despite being robbed from all the snow overnight. Below is the latest National Weather Service snow forecast for the tri-state region through Saturday morning. They are actually pretty bullish, forecasting 6-8 inches of snow across western and southern CT. Of course eastern NY has pretty much already made their mark with 16-25 inches on ground. Above is the surface chart for 1:33pm EST. Notice how all the cold air is near and west/north of NYC. Once you get too far east of NYC temperatures rise into the upper 30s and lower 40s. This presents problems because even when the strong dynamic lift moves in this evening and tonight and cools temperatures, it’s going to take much longer to get temperatures close to freezing over southwestern/southern CT vs. NYC. Basically, there is going to be a dramatic decrease in snow accumulation from west to east starting near NYC or extreme southwestern CT. Bridgeport/New Haven will be on the line between a few inches of snow and nothing. What a tough call. Not to mention that all this snow will be wet with slushy accumulations and melting rates under the snowpack. Thursday, February 25: 9:15 a.m.
Well I’ve been putting off talking about this setup. Most of the delay is due to me just not having as much enthusiasm for snow right now. We are in late winter and I’m looking forward to the storm chasing season…so please bare with me as I gather the strength this morning to write an analysis on this rain/snow event. For starters the heavy snow snow (12+ inches) will fall west and north of NYC. This storm is going to be big for the interior areas of the Northeast, namely the lower Hudson Valley up to Syracuse and upstate New York. Today heavy rain will fall over most of New England, with a rain/snow line pretty much right over NYC, and heavy snow west and north of NYC. 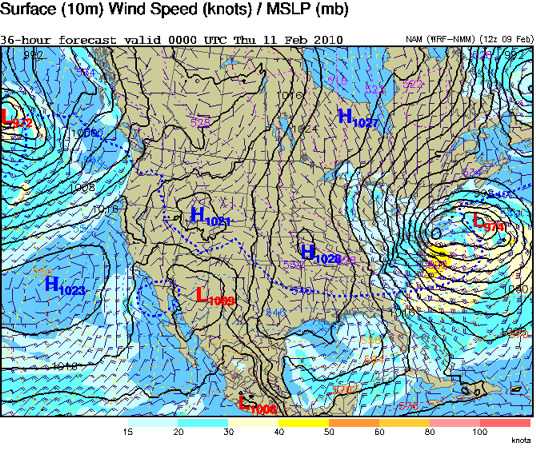 By this evening (Thursday evening) the intense low pressure system off the coast of New England will track westward as the upper level low retrogrades. This will bring intense large scale lift over southern New England/NYC region and cool the entire temperature profile. This will result in rain changing to wet snow from west to east from the NYC region over to southern Connecticut tonight. What makes this setup so bizarre is temperatures at the surface will be just above freezing, while temperatures above the surface will rapidly cool to well below freezing as the night wears on and the storm system raps up. The end result will be heavy very wet snow late tonight/early tomorrow morning over the NYC region/southern CT.
I’m going with 4-8 inches of wet snow accumulation by late Friday morning in the NYC to Stamford/Fairfield areas. My place in Shelton will probably be in that range too, but I’m worried I may be a bit too far east to be in the upper end of the range. If I had to pick a number I’d go with 5 for my place. But this is an especially difficult and strange setup to forecast. The ground is not cold and will remain above freezing throughout this entire event from NYC eastward. The surface temperature will also likely remain just above freezing. So we have a situation where very wet snow will fall like mad for hours on top of a ground that’s above freezing. So we have to take into account 1)wet snow has a lower ratio than dry snow, keeping snowfall totals down and more importantly 2) there will be a melting rate at the base of the snowpack throughout the event. So while even if the WRF model is correct in forecasting 1.2 of liquid equivalent precipitation, and normally that would bring about a foot of snow, we can’t use that kind of calculation/interpretation with this setup. As always I’ll take my five inches of snow and enjoy it. Spring is just around the corner….. Here we go again. This has been one wild winter for Texas and it isn’t over yet. Snow began falling this morning across western and central Texas, including the Dallas/Fort Worth metroplex. This is in response to a Pacific storm system interacting with another arctic cold front, bringing moisture over a cold dome of air at the surface. Typically this would result in sleet or freezing rain. But this winter has been anything but normal and all snow is expected to fall today across central Texas. This is because true arctic air has invaded Texas again and it is deep enough to support snow. Below is the National Weather Service forecast graphic for today from the Dallas office. They are expecting about an inch of snow for the Dallas/Fort Worth metroplex. Further south higher amounts ranging from 2 to as much as 5 inches of snow are expected, with locally higher amounts. At my apartment in Shelton, Connecticut I received about an inch of snow overnight. So once again Texas will top me in snow accumulation for the day. Does anyone else find that very disturbing? And might I remind everyone that Dallas received 12.5 inches of snow a couple weeks ago back on February 12, which broke the previous daily snowfall record of 12.1 inches set back on Jan 15/16 1964! What a snowy winter it’s been for Texas…. Sunday, February 21 Update: – Simon documents Dallas Supercell with Funnel! 5pm CST: At 4:25 p.m. CST Simon Brewer witnessed a supercell thunderstorm with a long rope funnel extending halfway to the ground 10 miles south-southwest of the intersection of highway 148 and I-20, or just just southeast of Dallas, TX. Jim Bishop immediately called the DFW National Weather Service Office and reported the funnel cloud. Simon continues to chase this supercell as it moves southeast over central Texas. The location and timing of the severe threat still appears to be from near the I-35 corridor in central Texas Sunday morning eastward into east Texas and Louisiana by the afternoon and evening. But the overall severe threat has diminished somewhat as computer models are not returning as much low level moisture which is limiting CAPE values. In addition the mid and upper level winds are more veered (westerly) on the latest models, showing less directional shear. Speed sheer will still be sufficient for severe storms and a possibly supercells – especially late in the morning near the I-35 corridor in central Texas. But the tornado threat looks quite low. The main threats will be hail and damaging winds, but even those threats have diminished somewhat since yesterday. Below: Latest SPC Outlook for Sunday. They too have reduced the severe risk for severe storms. But notice how they have extended there risk area further west to include central Texas/I-35 corridor. I’m happy to see this since it’s more in line with my thinking on the initial location of the severe threat. Below: My current severe storms forecast for Sunday, February 21 . We’ll see how it works out..I just wanted to provide a visual aid. It’s still early and the details will change. The tornado threat will diminish/shift east if the storm system speeds up any…. Jim's forecast made Friday, February 19 @ 10 a.m.
A shortwave trough is expected to eject eastward from the desert Southwest into the southern Plains early on Sunday and move quickly eastward into the lower Mississippi Valley by Sunday night. The exact timing of this shortwave will be crucial in determining where the severe storms will be most likely. From looking at all the models it seems the GFS and European models have the best handle on the system, although I wonder if the shortwave will slow down any further. A surface low should develop ahead of the shortwave early on Sunday over central Texas and move quickly to the northeast, reaching northeast Texas by midday. Dewpoints in the mid 50s to near 60 degrees are expected to expand northward in the morning through noon across central/eastern Texas. This combined with cold 500 mb temperatures near -18C will contribute to steep lapse rates. As a result CAPE values in the 500-1000 j/kg range are expected to develop in the morning to the midday from near Abilene to the I-35 corridor in Texas spreading further east by the afternoon. A pronounced dryline is expected to mix east quickly from West Texas to the I-35 corridor by the late morning as the surface low rapidly moves toward the northeast. This will provide for a good forcing mechanism for thunderstorms to develop late in the morning through midday from just west of the I-35 corridor in central Texas to just east of I-35. In addition a squall line should develop further north across Oklahoma into north Texas along an arctic front late in the morning. Wind shear across the whole region will be supportive of severe storms producing large hail and damaging winds. There will also be a tornado threat as storms develop along the dryline just west of the I-35 corridor near and south of the DFW region during the morning hours. This is supported by 40 knot 850 mb winds out of the south-southwest on top of backed surface flow, owing to good low to mid level wind shear. Storms will move rapidly to the northeast, probably around 40 mph or even faster, which will help increase low level wind shear. We’ll see how the timing of this system changes over the next couple days. But for now it looks like a decent fast moving supercell threat in the morning through midday across central to eastern Texas with a tornado threat mainly in the morning across central Texas. In addition a squall line should become dominant by the afternoon and spread across eastern Texas into Louisiana. It’s been a few days since my last post. Part of the reason for the delay is because of work. But the other reason is the lack of desire to talk about anymore snowstorms! It’s not that I don’t enjoy forecasting and tracking snow setups, but I’d much rather talk about severe weather setups like thunderstorms and tornadoes. I don’t think I’m alone with that notion. The problem is it’s mid February and we are in a winter that doesn’t want to give up. The cold keeps on coming and it’s going to be tough for any severe thunderstorm setups of significance to occur anytime soon. Having said that there is actually some potential for a severe thunderstorm setup on Sunday, February 21. So I thought I’d talk about that. The region of risk would basically cover the eastern half of Texas into the Arklatex region extending further east into the lower Mississippi Valley. Thunderstorms are possible ahead of an arctic front that should be diving south into the Plains on Sunday. Low pressure at the surface is expected to develop ahead of the front over Texas or the Arklatex region in response to a shortwave trough ejecting east from the Pacific. Dewpoints in the lower 60s should advect northward from the Gulf of Mexico into parts of east Texas and Louisiana. 500 mb temperatures will be quite cold, approximately -20C in advance of the arctic front, which will be plenty cold to provide steep lapse rates, owing to CAPE values in the 500-1000 j/kg range. Depending on the tilt of the shortwave and timing, there is the potential for severe thunderstorms across central/east Texas into Louisiana and possibly the lower Mississippi Valley on Sunday extending through Sunday night. Typically linear thunderstorms and/or squall lines tend to develop ahead of cold fronts, especially arctic fronts. But if a decent enough surface low develops over central to northeast Texas the dryline could come into play and bring the potential for more discrete storms. There probably won’t be much, if any, directional wind shear, and right now speed shear doesn’t look that impressive. So I tend to favor the development of a squall line right now..but it’s far too early to get into the details. I’ll watch the computer models over the coming days and see how the timing and tilt of the shortwave looks. But surely something interesting involving severe thunderstorms will happen on Sunday or Sunday night from Texas into the lower Mississippi Valley. Well, here we go again. Computer models are in agreement that yet another Alberta Clipper will eject into the Northeast late on Monday into Tuesday. Low pressure will develop off the New England coast late Monday night and a quick burst of moderate to heavy snow should occur Tuesday morning from the NYC region into southern and central New England. The exact amount of snowfall will depend on the exact track of the clipper. But right now anywhere from 2-6 inches could fall across southern Connecticut with more possible further north across interior Connecticut and central New England. Dare I say it…but D.C. should actually miss out on most of the heavier snow from this system. With 30-40 inches of snow on the ground there now I think they deserve a break. As for New England, we’ll take what we can get. In other news Dallas received a foot of snow on Thursday, February 11. This broke snowfall records for Dallas set back in 1978. That’s insane! The same storm system brought 2-5 inches of snow from Atlanta, Georgia to Columbia, South Carolina on Saturday. Over the weekend all 50 states had snow on the ground – that’s quite something. This sure has been an interesting winter across areas that don’t normally experience snow very often. Seriously though, is anybody else ready for Spring? It’s fun tracking these winter systems but I can’t wait to start tracking severe thunderstorms and tornado setups. Here’s to hoping for an active storm chasing season…bring it! Well the snow has passed and overall it was a little disappointing up here in Connecticut. Snow totals ranged from 2-4 inches around Bridgeport, 4-6 in my neighborhood (Shelton, CT) to 9-12 from Stamford, Greenwich down into NYC. Actually I may have closer to 7 inches…I measured 4 last night at 6pm, but we received another 2-3 inches overnight…either way still 4-5 inches under my expectations. 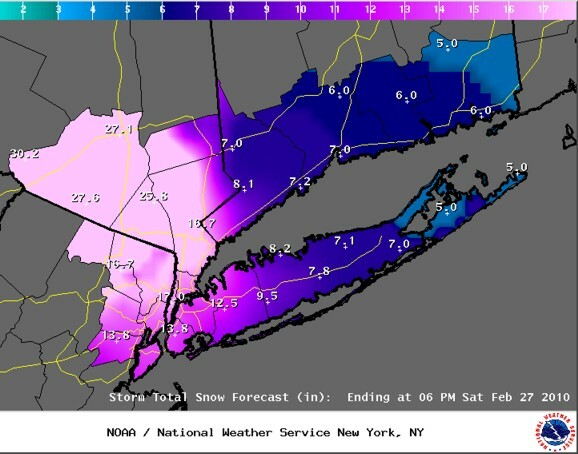 But the southern parts of NYC into New Jersey got hammered pretty good with anywhere from 12-17 inches reported. It really did come down to a matter of the coastal low remaining 20-30 miles further south than models were forecasting, which kept the heavy snow band over Long Island, extreme southwestern CT in New Jersey. 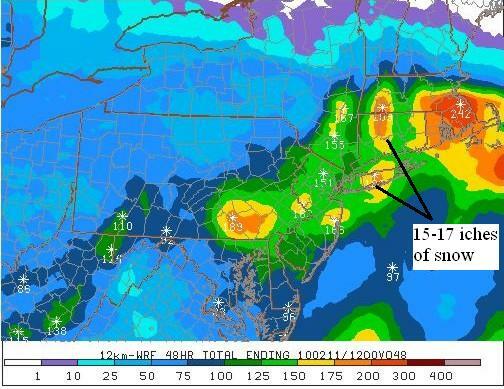 This combined with drier air further north in Connecticut resulted in a dramatic decrease in snow accumulation once you reached outside of the I-95/Fairfield county line in southwestern CT. But poor D.C. saw another foot of snow….those guys can’t seem to catch a break! On the bright side I had fun making another snowman. Tonight I should write Stormgasm.com on a white t-shirt and put it on him! Oh boy…..I haven’t slept well this week…..that’s all for now. After D.C. got hit hard this past weekend with over two feet of snow, a lot of New England winter weather enthusiasts are thirstier than ever after seeing no snow. Well those of you in the NYC tri-state region extending into all of Connecticut, Long Island and the rest of southern New England, you are about to get yours! A very intense Albert Clipper is currently leaving the Ohio Valley after dumping 6+ inches of snow over Cincinnati and other areas. This system is expected to reach the Mid Atlantic coast by late tonight and very early tomorrow morning. As that occurs low pressure will form off the Mid Atlantic coast and quickly intensify as it moves slowly northeast. The combination of intense dynamical forcing and rapid pressure falls at the surface will cause a band of heavy snow to develop from northern New Jersey into the NYC/Long Island region to CT and the rest of southern New England during the day tomorrow. WRF model suface pressures valid Wednesday evening. The latest WRF model is forecasting most areas in the NYC/CT region to receive about 12 inches of snow, with spotty areas receiving over 15 inches! So by just glancing at the 12z WRF model one would quickly forecast 12+ inches of snow in all areas (see the total WRF precip forecast below). However the model suggests a warm nose at 850mb from Long Island into coastal CT. This is associated with the intense warm air advection occurring ahead of the surface low. This will cause a sleet/snow mix to occur for one to three hours in the late morning to midday timeframe over Long Island and the I-95 corridor in CT. But the continued dynamical forcing should allow for the mixture to switch back to all snow by midday or the afternoon at the latest. At any rate this temporary mixing will keep snow accumulations in the 8-10 inch range over NYC, Long Island and the I-95 corridor in CT. Areas north of the Merritt in CT should receive 12-14 inches of snow, possibly more in isolated areas. Below: WRF model sounding for Bridgeport, CT (BDR) valid midday Wednesday. Notice the warm layer around 850mb, indicative of the strong warm air advection ahead of the surface low. 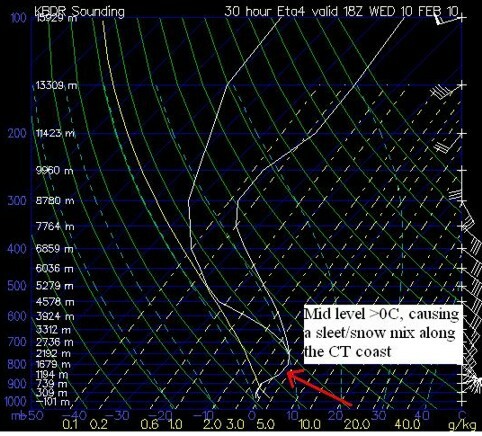 I’m thinking strong dynamic lift/forcing will overcome this warm advection across interior areas of CT, but along I-95 and over Long Island expect a 1-3 hour window in the late morning to midday timefame when the snow mixes with sleet. By the afternoon the dynamical forcing will take over and all snow will fall along the coast. It looks like I’ll probably be working from home tomorrow in light of the snowstorm. All I have to say is bring it!!! I may finally see a full foot of snow up here in Shelton. Tomorrow’s winter storm is looking bigger for NYC, Long Island and southern Connecticut. I’m thinking areas from northern New Jersey through the NYC region into southern CT will get 8-12 inches of snow. But I’m worried some of those areas could get 12+ inches should the coastal low track just a tad further north. New England, This One is for You! After the Mid Atlantic got hit hard this weekend it’s New England’s turn. Models are in a good agreement that an intense Alberta Clipper will eject across the Northeast late Tuesday night through Wednesday. A coastal low is expected to develop early on Wednesday and quickly intensify as it tracks slowly northeast up the coast. But I can’t ignore the D.C. area, even through I’m bitter they got all that snow this weekend. They too will share in the snow on Wednesday. Actually the snow will fall late Tuesday night into Wednesday morning for you guys down there and 6-10 inches of additional snow should be on the ground by Wednesday evening. So that makes a grand total of around 40 inches of snow on the ground for the D.C. area by Wednesday evening? Wow, that’s insane! I’m jealous but I’m starting to feel sorry for the people down there who don’t like snow. I mean a foot or two is one thing, but 40 inches….that’s just nuts.